Our beautiful gifts are carefully selected and created with our customers and their babies in mind. Many of our gifts are handmade exclusively for 9 to Nest! 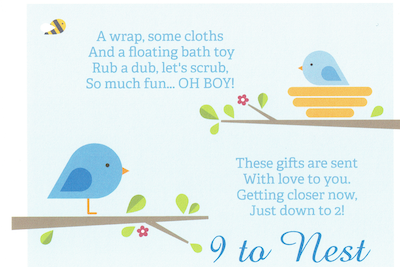 Each gift is accompanied with a poem that counts down the months until baby's arrival. Our products are BPA free, PVC free and Phthalate free for your baby’s health and safety. All fabric items are machine washable for convenience and easy care. Our gifts will continue to change and evolve over time to enhance the enjoyment and excitement of customers and recipients. 9 to Nest is a great concept. Effortlessly, I arranged to have a gift delivered to my friends each month of their pregnancy as a tangible reminder that I care and share their anticipation of the new baby. 9 to Nest helped me share this special time of my friends' lives. I purchased a 9 to Nest gift for one of my employees and it was so much fun for her to know how much I appreciate all of her hard work on a monthly basis! These gifts make all moms feel special and loved! The first thing I did when my son and daugther-in-law told me they were expecting was to subscribe to 9 to Nest! She absolutely loved getting the baby gifts. She looked so forward to each one arriving! 9 to Nest is the perfect gift for expecting moms. Each moth you receive a surprise gift that is most sweet and also themed around bedtime, bath or eating! It's a great addition to what you have, but a reminder of those items you may need. I looked forward to the surprise each month! 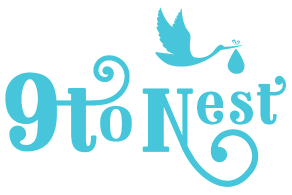 I have chosen to give 9 to Nest as a baby shower gift for some of my girlfriends who were expecting. They absolutely LOVED receiving a new package each month! I loved getting a text or call to let me know what they had opened. The surprise element of 9 to Nest was just as much fun for me (the gift giver) as it was for them! I HIGHLY recommend 9 to Nest to those who have loved ones expecting! She looked so forward to each one arriving! A wonderful easy way to celebrate a new baby ad share your excitement! Quality gifts automatically sent directly with a couple of mouse clicks. Couldn't be easier! One of the highlights of this past pregnancy was receiving these sweet packages from 9 to Nest. It is such a special and thoughtful way to help countdown to the baby's arrival. I have been looking for a company like 9 to Nest. I like to shop, but like many people am busy, busy, busy. I wanted a truly special gift for our very special baby (first one in the family in 15 years), but am no longer up to date on what’s needed, let alone safe and hip for our precious baby to be. I’ve subscribed to other monthly services like Birch Box and Bark Box, but 9 to Nest goes above and beyond with its darling poems, beautiful gift boxes and high quality unique gifts for a very reasonable price. For the price of one big gift, the parents-to-be got multiple gifts that came every month, counting down to the big day. What a darling idea! I am thrilled with 9 to Nest, a gift that involves little work and generates multiple of oohs and aahs. I was expecting my first and much awaited baby and my cousin sent me gifts through 9 to Nest. All the gifts are exceptionally high quality and many are not available in stores. Very thoughtful and timely gifts just makes you feel well cared for. A friend and I purchased 9 to Nest together for a mutual friend who was expecting her first baby. It was a wonderful, thoughtful (but hassle-free!) way to share in all of the excitement. I looked forward to hearing about my friend's gift box each month, and she was eager to share. It was especially fun to give her her second to last gift box at her baby shower - 9 to Nest was a hit with everyone there! Thanks for helping us Share the Joy during this very special time.